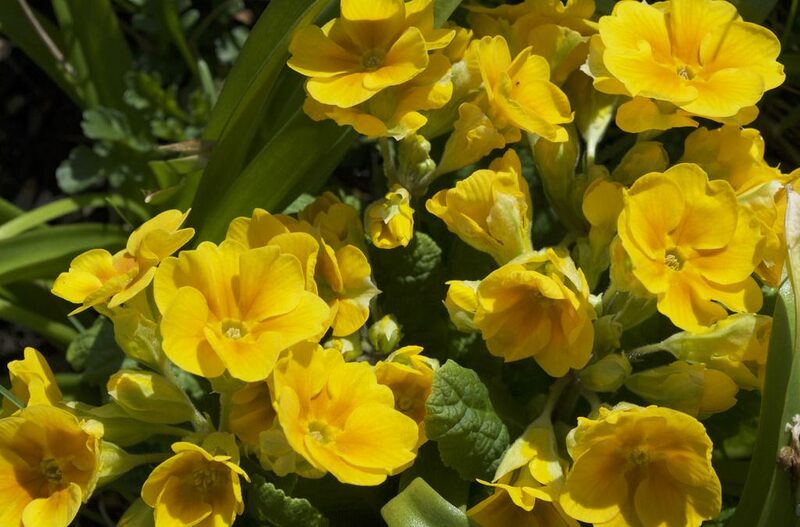 It does indeed seem remarkable that the Hose-in-Hose variant of Primrose (Primula vulgaris) and Polyanthus (P. x tommasinii (J. Richards, Primula 1993)) has all but disappeared from commercial horticulture in the United Kingdom over the past twenty-five or thirty years. This delightful form in which the calyx of the Primula flower is transformed into a second petaloid structure, giving the impression of one identical flower within the other. Originally, this flower variant was given the name Hose-in-Hose because the form of the flower is reminiscent of the way some Elizabethan gentlemen used to wear their stockings, one inside the other with the outer stocking turned down. The origin of the name gives us an idea of the antiquity of this type of Primula and in fact John Gerard makes the first recorded mention of a Hose-in-Hose flower, in his 1597 herbal. Parkinson also mentions the variant and illustrates it in his ‘Paradisi in Sole’ in 1629. The Hose-in-Hose mutation, for that is what it is, has occurred quite frequently in wild populations of Primula and this is where the Elizabethan herbalists must have isolated the type, for use as an ornamental plant. A number of other floral mutations exist within Primula and it is now possible not only to recount the rich history of these variants but also to inform gardeners of some new British research into the genetic mechanism of these traits. Margaret Webster who is a mature PhD student at Leeds University has spent the last 15 years collecting and researching the various floral mutants of Primrose and is preparing to publish her thesis on the development of and the inheritance of these traits. Margaret’s work has been a true labour of love and will form an integral part of a more complex picture when the molecular work on her collection, already begun in Leeds University under Professor P.M. Gilmartin, is completed. This research follows in the great tradition of British plant genetics rooted in some of Charles Darwin’s original work. In addition to the Hose-in-Hose variant there are at least three other groups of flower types within Primrose and Polyanthus that are of horticultural interest. b. Jack-in-the-green, where the sepals become leafy and can be enlarged, forming a green collar to the flower. Galligaskins are sometimes placed in their own group but are probably better treated as a variation of Jack-in-the-green with large and sometimes slightly twisted leafy sepals. c. Jackanapes types combine floral and leafy tissue in the calyx. The tips of the calyx are leafy and the lower parts petaloid. Pantaloon (striped trousers) types, where a stripe of green is seen along the middle of a petaloid sepal, have previously been described as a variant of Jackanapes but according to Margaret Webster should be classified as an incompletely expressed Hose-in-Hose. Although all these floral mutants have their own particular charm and history it is the newest developments of the Hose-in-hose types that will be the focus of the rest of this article. Gardeners have prized Hose-in-Hose primroses and Polyanthus for more than 400 years otherwise Gerard and Parkinson would not have mentioned them in their publications. There are numerous references to this flower type in the 19th century but the illustrations in H. Cannell’s Floral Guides of the 1870’s are perhaps the most inspiring. The appropriately named King of Hose-in-Hose was a magnificent Gold Laced type, a plant of which could be acquired for 10 shillings. It was not until Sacheverell Sitwell published his ‘Old Fashioned Garden Flowers’ in 1939 that an author really gave the Primrose variants there proper due. Peter Ward states, in ‘Primroses and Polyanthus’, that the Hose-in-hose character is best displayed using the plant habit of the Polyanthius type. Undoubtedly he is right as the heavier flower heads of the Hose-in-hose type nod down and their beauty can only be appreciated at the top of the elongated flower stem of the Polyanthus. The position of the flowers in this type also helps to keep the flowers clean free from mud splashes when it rains. The Polyanthus type of flower was really popularised by Gertrude Jekyll in the late 19th century and her Munstead selection of yellow and white flowered types was famous in her lifetime for its hardiness and show of colour. The Munstead strain has been developed further over the years and we can, in part, thank Miss Jekyll for the marvellous Polyanthus we have in our gardens today. The named varieties known to Sitwell such as Lady Dora (bright yellow), Lady Lettice (yellow with pink blush) and Lady Molly (Magenta) were the collector’s items of their era but sadly they have been lost to the gardener’s of today. Sitwell waxes lyrical about some of these older varieties, "The velvety scent is of a richness and fragrance nowhere else to be found. It is matchless and incomparable." He goes on to say that the Polyanthus is really a sunset flower, the colours holding the evening light. UK national collection holders, Mrs Jackson and Mrs Shaw are not able to list a single historic named variety of Hose-in-Hose Primula in their collections. Typically these old varieties were propagated by division and infection by viruses and fungal diseases progressively weakened the stock and it is now almost impossible to obtain authentic named varieties of reliable provenance. It would seem that Hose-in-Hose Primulas are, at best, a rarity and to the average British gardener unobtainable. The new series comes from the research of Kees Sahin in The Netherlands who has been working on this project for 15 years. The origins of these new plants can of course be traced back to the original wild mutations mentioned in Gerard but more recently they can be connected directly to the work of Florence Levy whose breeding work in Oregon in the 1930’s and 1940’s gave birth to the Barnhaven range of Primula. The first Hose-in-Hose types became available from seed in the late 1940’s but these were never true breeding and didn’t yield a uniform population of Hose-in-Hose types. Jared Sinclair in North Western England, where Kees Sahin obtained seed in the mid 1980’s, continued Florence Levy’s work. Angela Bradford, working in France still maintains the Barnhaven tradition and a mixture of Hose-in-Hose Polyanthus can still be purchased from her nursery. Kees Sahin has for the first time given us a series of true breeding Hose-in-Hose Polyanthus, in a range of colours including: white, cream, yellow, rose, red lace, silver lace, deep purple, blue and light blue. The first blue Hose-in-Hose previously recorded (N.A.P.S. yearbook S. Section 1998, American Primrose Society summer 1999, N.A.P.S.Midland and West, "Argus" 2000) was raised by Margaret Webster in her own garden in Bristol the first of which flowered for the first time in 1997. Mr Sahin has not lost any of the treasured attributes of hardiness and rich fragrance from the original Barnhaven stock and there can be no doubt that these new selections are worthy garden plants. However seed production continues to be a challenge and the planned limited release of the new series will be very restricted. The future of Hose-in-Hose Polyanthus certainly seems to have been assured by the work of Kees Sahin and more British gardeners will have the opportunity to enjoy the pleasure of their delicate beauty. In addition to this excellent piece of classical plant breeding the publication of Margaret Webster’s research on the inheritance and morphological development of floral mutants in Primula will help us all understand the inner workings of these flowers. Sitwell would have been fascinated by Margaret’s work as so many of his questions on the aberrations in flowering have now been answered. It is only right then to leave the final words to Sacheverell Sitwell himself, "…Hose-in-Hose, Jack-in-the-Green, Jackanapes and Gallygaskins should never be resisted by anyone who has the chance of buying a plant".